World War I Collector - WW1/WW2 Memorabilia Collection - Thompson, Patrick H.
The military career of Captain Patrick H. Thompson spanned a period from 1927 to 1958. He began his career as an enlisted man and subsequently rose to Captain. This may well have been a battlefield commission. Thompson was born in Greenwood, SC on July 22, 1904 and died in Arlington, VA in April, 1998. He is buried in the Columbarium in Arlington National Cemetary. 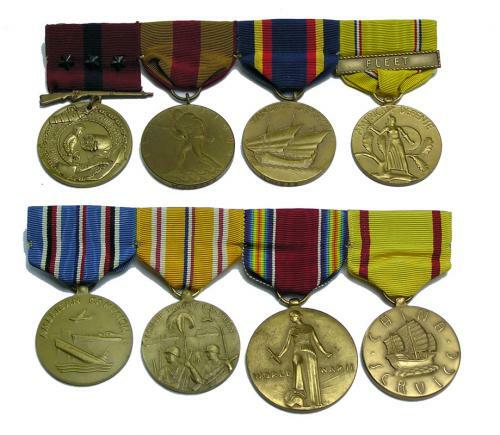 The medal group consists of two mounted medal bars. 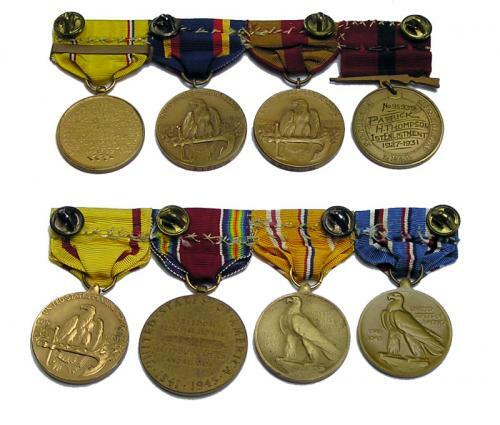 The first one consists of his USMC Good Conduct medal with the reverse engraved with his serial number, 95939, name and the engraving "1st enlistment 1927-1931", Expeditions medal engraved on the rim "M No. 5368", Yangtze Service medal engraved on the rim "M.No. 912", and American Defense medal. The second bar consists of his China Service medal, WW2 Victory medal, Asiatic Pacific Campaign medal. and American Campaign medal. Some new information is now on ancestry.com with the Marine muster rolls. In 1940, Thompson had achieved the rank of Gunnery Sergeant. His service record for WW2 is yet undiscovered. Muster roll data shows him at the following stations and ranks: January, 1927 Private A Company, Recruit Battalion, Recruit Depot, Marine Barracks, Parris Island; March, 1927 Private Sea School Detachment, Marine Barracks, Navy Yard, Norfolk, Virginia; May, 1927 Marine Detachment, USS Sacramento, Olonggapo, P.I. ; May, 1927 Marine Barracks, Navy Yards, Norfolk, Virginia; June 1927 Marine Detachment, USS Seattle, Portland, Maine; August, 1927 Marine Detachment, USS Seattle, Navy Yard, New York, NY; September, 1927 PFC, Marine Detachment, USS Tennessee, San Pedro, California; November, 1927 Mcb Headquarters Company, Mcb Nob, San Diego, California; November, 1927 Marine Deyachment, USS Tennesee, San Pedro, California; December, 1927 Mcb Headquarters and Headquarters Company, Mcb Nob, San Diego, California; July, 1928 Casual Detachment, US Marine Corps, Aboard USS Grant "Debarkation Roster"; September, 1928, Corporal, Headquarters and Headquarters Company, Second Battalion, Sixth Regiment, Tientsin, China; October, 1928 Headquarters and Headquarters Company, Second Battalion, Sixth Regiment, Waller Billet, Third Brigade, Tientsin, China; November, 1928 78th Company, 2nd Battalion, 8th Regiment, 3rd Brigade, Tientsin, China; December, 1928 Headquarters and Headquarters Company, Second Battalion, Sixth Regiment, Third Brigade; January, 1929 Headquarters and Headquarters Company, Second Battalion, Sixth Regiment, USS Henderson; January, 1929 21st Company, Third Bn. Fourth Regiment Third Brigade, Rifle Range, Maquinaya, PI; 22nd Company, Third Battlion, Fourth Regiment USMC, Shanghai, China; February, 1929 Sergeant, Headquarters and Headquarters Company, Fourth Regiment, 118 Sinza Road, Shanghai, China; February, 1930 Headquarters and Headquarters Company, Forth Marines, Mcef, Shanghai, China; March, 1930 Marine Detachment, Receiving Station, Navy Yard, Philadelphia, Pennsylvania; May, 1930 Marine Barracks, Naval Station, Cavite, PI; May, 1930 Headquarters and Headquarters Company, 4th Marines, Mcef, 118 Sinza, Shanghia, China; July, 1930 Headquarters and Headquarters Company, 4th Marines, Mcef, Shanghai, China; August, 1930 Headquarters and Headquarters Company, 4th Marines, Mcef, 50 Haiphong Road, Shanghai, China; August, 1931 Casual Company Number 2, Marine Corps Base, San Diego, California; August, 1931 Marine Barracks, Navy Yard, Mare Island, California; September, 1931 Casual Company Number 2, Marine Corps Base, San Diego, California; September, 1931 Company B Separate Battalion, Marine Corps Base, San Diego, California; November, 1931 Company D, Separate Infantry Battalion, Marine Corps Base, Naval Operating Base, San Diego, California; December, 1931 C Company, Separate Infantry Battalion, Marine Corps Base, San Diego, California; January, 1932 Company D, Separate Infantry Battalion, USS Henderson at Sea; March, 1932 Casual Company Number 1, Marine Corps Base, San Diego, California; April, 1932 Marine Barracks, Norfolk Navy Yard, Portsmouth, Virginia; April, 1932 Marine Barracks, Quantico, Virginia; April, 1932 Marine Barracks, Submarine Base, Coco Solo, Canal Zone; July, 1932 First Provisional Company, MD, Camp Rapidan, Criglersville, Virginia; August, 1932 Rifle Range Detachment, Post Service Battalion, Mb, Quantico, Virginia; September, 1932 First Provisional Company, MD, Camp Rapida, Criglersville, Virginia; October, 1932 Marine Barracks, Submarine Base, Coco Solo, Canal Zone; November, 1932 First Provisional Company, MD, Camp Rapidan, Criglersville, Virginia; November, 1932 Marine Barracks, Quantico, Virginia; December, 1932 C Company, Recruit Dept, Mb, Parris Island, South Carolina; January, 1933 Headquarters Detachment, Rd, Mb, Parris Island, South Carolina; July, 1933 Marine Barracks, Navy Yard, Lrague Island, Pennsylvania; January, 1934 Schools Detachment, Marine Barracks, Navy Yard, Philadelphia, Pennsylvania; February, 1934 Marine Barricks, Navy Yard, League Island, Pennsylvania; March, 1934 Headquarters Detachment, Recruit Depot, Marine Barracks, Parris Island, SC; April, 1934 Rifle Range Detachment, Rd, Mb, Parris Island, SC; May, 1934 Headquaeters Detachment, Recruit Depot, Marine Barracks, Parris Island, SC; Rifle Range Detachment, Recruit Depot, Mb, Parris Island, SC; June, 1934 Marine Barracks, Washington, District of Columbia; July, 1934 Marine Detachment, Rifle Range, Wakefield, Mass. ; September, 1934 Marine Barracks,Washington, District of Columbia; November, 1934 Marine Barracks, Naval Air Station, Sunnyvale, Californis; December, 1934 Marine Barracks, Washington, District of Columbia; January, 1935 Marine Barracks, Naval Air Station, Sunnyvale, California; May, 1935 Marine Barracks, Quantico, Virginia; June, 1935 Marine Barracks, Wahington, District of Columbia; November, 1935 Marine Detachment, Warm Springs, GA; Marine Barracks, Warm Springs, Georgia, Marine Barracks, Quantico, Virginia; January, 1936 Marine Barracks, Naval Ammunition Depot, St. Juliens Creek, Portsmouth, Virginia; May, 1936 Marine Barracks, Washington, District of Columbia; April, 1936 Vo Squadron 9m, Fleet Marine Force, St. Thomas, Virgin Islands; Marine Barracks, Washington, District of Columbia; June, 1936 Vo Squadron 9m, Fleet Marine Force, St. Thomas, Virgin Islands; June, 1936, Marine Corps Rifle and Pistol Team Detachment, Rifle Range, Wakefield, Mass. ; August, 1936 Marine Corps Rifle and Pistol Team Detachment, Camp Perry, Ohio; September, 1936 Marine Corps Rifle and Pistol Team Detachment, Rifle Range, Quantico, Virginia; October, 1936 Rifle Range Detachment, Post Servive Battalion, Marine Barracks, Quantico, Virginia; October, 1936 Marine Barracks, Navy Yard, League Island, Pennsylvania; November, 1936 Rifle Range Detachment, Post Service Battalion, Marine Barracks, Quantico, Virginia; December, 1936 Marine Barracks, Quantico, Virginia; December, 1936 Marine Barracks, Navy Yard, Leagur Island, Pennsylvania; January, 1937 Marine Barracks, Quantico, Virginia; January, 1937 Marine Barracks, Navy Yard, League Island, Pennsylvania; March, 1937 Rifle Range Detachment, Post Service Battalion, Marine Barracks, Quantico, Virginia; April, 1937; May, 1937 Marine Detachment, Rifle Range, Wakefield, Mass. ; August, 1937 Marine Corps Rifle and Pistol Team Detachment, Camp Perry, Ohio; October, 1937 Marine Barracks, Navy Yard, League, Pennsylvania; December, 1937 Marine Barracks, Recruit Depot, Parris Island, SC; January, 1939 Sea school Detachment, Marine Barracks, Norfolk Navt Yard, Portsmouth, Virginia; January, 1939 Marine Detachment, USS Virginia, Marine Barracks, Navy Yard, Philadelphia, Pennsylvania; February, 1939 Marine Detachment, USS Wichita, Navy Yard, Philadelphia, Pennsylvania; April, 1939 Marine Detachment, USS West Virginia, Balboa, Canal Zone, Panama; May, 1939 Marine Detachment, USS Wichita; July, 1939 Marine Detachment, Rifle Range, Cape May, NJ; August, 1939 Marine Detachment, USS West Virginia, Puget Sound Navy Yard, Bremerton, WA; September, 1939 Marine Detachment, USS Wichta; December, 1939 Marine Detachment, USS Texas; March, 1940 Marine Detachment, USS Tuscaloosa, Enroute, New York, NY; April, 1940 Marine Derachment, USS Texas; May, 1940 Marine Detachment, USS Tuscaloosa, New York Navy Yard, NY; June, 1940 Marine Detachment, Rifle Range, Cape May, New Jersey; June, 1940 Marine Detachment, USS Texas; August, 1940 Marine Detachment, Guantanamo, Cuba; October, 1940 Marine Detachment, USS Texas; November and December, 1940 Attached to the Depot of Supplies, Philadelphia, PA.